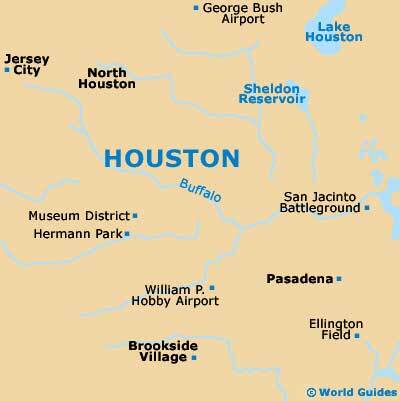 Houston lies in the southeastern corner of Texas, near the Gulf of Mexico in southern USA, and is the largest city in the whole of Texas. Founded in 1836, Houston became one of the country's most wealthy exporters of oil. Since a major slump in the 1980s, the local economy has diversified greatly, including major aerospace, medical services and tourism, and the city is once again oozing with wealth and money, attracting tourists from around the globe. Houston spreads out from its center in a vast network of roads, freeways and enormous shopping districts, and is also a thriving seaport, with a busy shipping channel from Galveston Bay. The Westheimer Road is an important east to west thoroughfare, and connects the popular Galleria Shopping Mall, the upmarket River Oaks district and the Upper Kirby area. Providing a useful source for current tourist information, the Greater Houston Convention and Visitors Bureau is worth visiting and can be found on Bagby Street, in between McKinney Street and Walker Street. This is a good place to pick up free maps and leaflets about the attractions within the Downtown district, the Midtown and Uptown areas, and also the Museum and Theater districts. The George Bush Intercontinental Airport (IAH) can be found 22 miles / 33 km to the north of central Houston, next to the town of Bordersville, and includes plenty of neighboring cheap accommodation options. Budget hotels are common in Houston and are concentrated around the Northwest Freeway, the Katy Freeway and also on the Southwest Freeway. Many of the city's best hotels are situated in the heart of the city center. More information about Houston Hotels. Houston has many world-class tourist attractions, including the Downtown Aquarium - containing an enormous half-million gallon complex, showcasing underwater life from around the world; Houston Zoo - home to an array of attractions and animals, including Natural Encounters, where visitors are able to get close to many of the animals; the Space Center - a premier tourist attraction, full of interactive displays and a host of information about space travel; Hermann Park - a huge park close to downtown, containing a landscaped Japanese Garden; Sam Houston Park - overlooking by towering skyscrapers and home to a particularly historic log cabin, tearooms and museum area; and the Bayou Bend Collection and Gardens - a 28-room mansion set in the River Oaks residential neighborhood. Other important landmarks include the JP Morgan Chase Tower - the tallest building in the entire city, featuring an observation deck; City Hall - constructed of Texas Cordova limestone, with museum areas and hosting a number of important Texan festivals; the Julia Ideson Library Building - dating back to the 1920s, housing the impressive Circle M. Collection and linked to the Ideson Library by a convenient tunnel; the Nina Vance Alley Theater - situated in downtown Houston, with two theaters and regular performances; and the Oscar F. Holcombe Civic Center - a multimillion dollar complex with four exhibition buildings holding a host a major events throughout the annual calendar. 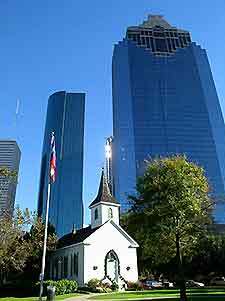 More information about Houston Tourist Attractions and Houston Landmarks. 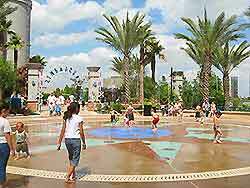 Tourist attractions situated near to Houston include the George Ranch Historical Park, the Gulf Greyhound Park, the Kemah Boardwalk, the Moody Gardens, the San Jacinto Battlefield and the Six Flags Astroworld / Waterworld. The Galveston Beach area is especially nearby and is the perfect place to relax, away from busy city life. Houston boasts some truly excellent museums and these include the Children's Museum - a family attraction with a tantalizing exterior, aimed at children up to 12 years old; the Byzantine Fresco Chapel Museum - housing the only intact frescoes in the whole of the Western Hemisphere; the Houston Museum of Natural Science (HMNS) - situated in Hermann Park, boasting dinosaur skeletons, an IMAX theater and a planetarium; the Menil Collection - perhaps the most prized collection of art in the city, with over 15,000 contemporary pieces; the Lawndale Art Center - a renovated art-deco building with four gallery spaces and information about local artists; the Museum of Fine Arts - the city's premier art museum, consisting of more than 40,000 works; the Contemporary Arts Museum - full of interesting avant-garde exhibitions of paintings and known for its aluminum-clad exterior; and the Rice University Art Gallery - part of the Rice University campus, loaded with contemporary visual art. 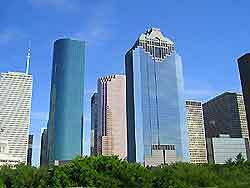 More information about Houston Museums and Houston Art Galleries.